This bakery countertop display case has three removable shelves that are deep enough to hold you treats from falling into the display case when you serve your customer. The back of this case lifts up, allowing you to serve your customers with ease. This Bakery Display Cube offers a space maximizing way to organize your goods. 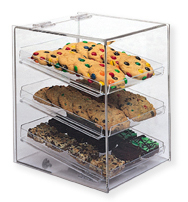 Made of clear Acrylic, this Countertop Pastry Display, Food Display is a hassle-free way to display items. Buy Bakery Display Cube now - Use our convenient shopping cart or give us a call and place your order with a knowledgeable service representative today!